Kennewick Man is the name for the skeletal remains of a prehistoric man found on a bank of the Columbia River in Kennewick, Washington, on July 28, 1996. It is one of the most complete ancient skeletons ever found; bone tests have shown it to date from 7300 to 7600 B.C. A stone projectile was found lodged in the man's hip bone. His anatomical features were quite different from those of modern Native Americans and his relationship to other ancient people is uncertain. The finding of the skeleton triggered a nine-year legal clash between scientists, the US government and Native American tribes who claim Kennewick Man as one of their ancestors. In February 2004, the United States Court of Appeals for the Ninth Circuit ruled that a cultural link between any of the Native American tribes and the Kennewick Man was not genetically justified, allowing scientific study of the remains to continue. In July 2005, a team of scientists from around the United States convened in Seattle for ten days to study the remains in detail. The discovery of Kennewick Man was accidental; a pair of spectators (Will Thomas and David Deacy) found his skull in the Columbia River at Columbia Park while attending the annual hydroplane races. The remains had been scattered in the reservoir due to erosion. Following delivery of the cranium by the coroner, they were examined by archaeologist James Chatters. After ten visits to the site, Chatters had managed to collect 350 bones and pieces of bone, which with the skull completed almost an entire skeleton. The cranium was fully intact with all the teeth that had been present at the time of death. All major bones were found, except the sternum and a few bones of the hands and feet. The remains were determined to be those of "a male of late middle age (40-55 years), and tall (170 to 176 cm, 5'7"-5'9") slender build". Many of the bones were broken into several pieces. At the University of California at Riverside, a small bone fragment was subjected to radiocarbon dating. This fixed the age of the skeleton at approximately 9300 to 9600 years (8,400 uncalibrated "radiocarbon years"), not the nineteenth century, as had originally been assumed. After studying the bones, Chatters concluded they belonged to a Caucasoid male about 68 inches (173 cm) tall who had died in his mid fifties. Chatters found that bone had partially grown around a 79 mm (3.1 in) stone projectile lodged in the ilium, part of the pelvic bone. On x-ray, nothing appeared. Chatters put the bone through a CT scan, and it was discovered that the projectile was made from a siliceous gray stone that was found to have igneous (intrusive volcanic) origins. The projectile was leaf-shaped, long, broad and had serrated edges, all fitting the definition of a Cascade point. This type of point is a feature of the Cascade phase, which occurred roughly 7,500 to 12,000 years ago. To further investigate the mystery of the Kennewick man and determine whether the skeleton belonged to the Umatilla Native American tribe, an extraction of DNA was analyzed. However, according to the report of the scientists performing the DNA analysis, "available technology and protocols do not allow the analysis of ancient DNA from these remains." Anthropologist Joseph Powell of the University of New Mexico was also allowed to examine the remains. Powell used craniometric data obtained by anthropologist William White Howells of Harvard University and anthropologist Tsunehiko Hanihara of Saga University that had the advantage of including data drawn from Asian and North American populations. Powell said that Kennewick Man was not European but most resembled the Ainu and Polynesians. Powell said that the Ainu descend from the Jomon people who are an East Asian population with "closest biological affinity with south-east Asians rather than western Eurasian peoples". Furthermore, Powell said that dental analysis showed the skull to have a 94 percent chance of being a Sundadont group like the Ainu and Polynesians and only a 48 percent chance of being a Sinodont group like that of North Asia. Powell said analysis of the skull showed it to be "unlike American Indians and Europeans". Powell concluded that Kennewick man "is clearly not a Caucasoid unless Ainu and Polynesians are considered Caucasoid." Chatters et al. conducted a graphic comparison, including size, of Kennewick Man to eighteen modern populations and showed Kennewick Man to be most closely related to the Ainu. However, when size was excluded as a factor, no association to any population was established. Chatters said that anthropologist C. Loring Brace classified Ainu and Polynesians as a single craniofacial Jomon-Pacific cluster and Chatters said "Polynesians have craniofacial similarities to Asian, Australian and European peoples". Brace himself stated in a 2006 interview with the Tri-City Herald that his analysis of the skeleton indicated that Kennewick Man was related to the Ainu. The biological diversity among ancient skulls in the Americas has further complicated attempts to establish how closely Kennewick Man is related to any modern Native American tribes. Skulls older than 8,000 years old have been found to possess greater physical diversity than do those of modern Native Americans. This range implies that there was a genetic shift in populations about 8,000 years ago. The heterogeneity of these early people shows that genetic drift had already occurred, meaning the racial type represented by Kennewick Man had been in existence for a considerable period. In 2005, a 10-day examination of the skeleton led by forensic anthropologist Douglas Owsley revealed that Kennewick Man had suffered from mild arthritis in one elbow, both knees and several vertebrae. In addition to the healed injury from a stone spear tip lodged in the hip, they found evidence of a broken and healed rib and two depression fractures in the head, none of which was fatal. The man had been deliberately buried by the river bank. In 2012, Owsley announced that isotope measurements of the bones indicated that the man had most likely lived off a diet of marine mammals and that he had not drunk much water from the Columbia River, suggesting that he originally came from a coastal area. 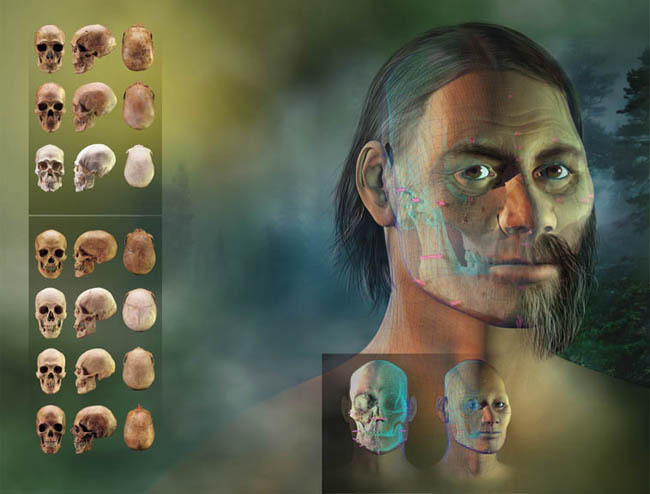 Owsley further confirmed that the skull's features resemble those of the Ainu and suggested that the man's ancestors may have retreated from advancing people from central Asia and traveled by boat over generations along the coast northward and east to North America. The discovery of Kennewick Man, along with other ancient skeletons, has furthered scientific debate over the exact origin and history of early Native American people. One hypothesis holds that a single wave of migration occurred, consisting of hunters and gatherers following large herds of game, which wandered across the Bering land bridge around 12,000 years ago. Other hypotheses contend that there were numerous waves of migration to the Americas. The apparent diversity of ancient skeletal remains, which may include traits not typically associated with modern Native Americans, has been used as evidence to support these rival hypotheses. A 2008 study on the genetics of modern Native American populations suggests that the 86 samples taken are descendants of a single migration that spread out along a coastal route prior to the Clovis era. A long-running debate over an ancient skeleton known as Kennewick Man has been reignited. The 9,000-year-old was claimed as an ancestor by Native Americans, who called for his remains to be reburied. However, a group of anthropologists said the specimen's features were not similar to people from local tribes and won a legal bid to study the bones. Now a genetic analysis has revealed his DNA is more closely related to modern Native Americans than to anyone else. The relatives of a much-debated 8,500-year-old skeleton found in Kennewick, Washington, have been pinned down: The middle-age man was most closely related to modern-day Native Americans, DNA from his hand reveals. The new analysis lays to rest wilder theories about the ancestry of the ancient American, dubbed Kennewick Man. He's the most important human skeleton ever found in North America and here, for the first time, is his story. In the summer of 1996, two college students in Kennewick, Washington, stumbled on a human skull while wading in the shallows along the Columbia River. They called the police. The police brought in the Benton County coroner, Floyd Johnson, who was puzzled by the skull, and he in turn contacted James Chatters, a local archaeologist. Chatters and the coroner returned to the site and, in the dying light of evening, plucked almost an entire skeleton from the mud and sand. They carried the bones back to Chatters' lab and spread them out on a table. Kennewick Man was laid to rest alongside a river more than 9,000 years ago, buried by other people, a leading forensic scientist said Thursday. The skeleton, one of the oldest and most complete ever found in North America, has been under close analysis since courts sided with researchers in a legal battle with Indian tribes in the Northwest who wanted the remains found near the Columbia River reburied without study.